I read so many contemptuous comments directed at so-called "pixel peepers." These are photographers with the habit of viewing their photographs at high magnification to assess critical details. Photographers who "chimp" their shots (meaning to CHeck IMage Preview -- or review them on the LCD display after their capture) are similarly criticized. "Peepers" and "chimpers" are regarded as the anally compulsive geeks of the photographic community, and the utility of their practices is broadly questioned. They don't have the "cool" sort of confidence and bravado of knowing with 100% certainty that every snap of the shutter is absolutely perfect and yields exactly what the photographer intended. These practices are born of the the humble belief that not even the best photographer can nail every shot with perfect exposure and focus -- the very same belief underlying practices such as exposure bracketing. As one of the humbler, uncool photographers, I feel it is useful for me to explain to my cooler colleagues why we do the peculiar things we do. My emphasis will be on "pixel peeping," which is the most reviled practice of all, but I'll also address "chimping." Note: for a shocking video exposé of the hidden world of peeping and chimping in professional photography, click here. I don't really understand why "pixel peeping" practice is so despised. Perhaps there is some expectation by non-"pixel peepers" that we "peepers" are shocked and dismayed to discover our photos are made up of tiny little squares, otherwise known as pixels, and that we are seeking ways to make the squares go away? If so, they must not think we're very bright. Perhaps they think we're shocked to discover our images have some blur or chromatic aberration (color fringing)? If so, they must think we're naiive. When we "peep" (or "chimp"), we're simply checking our images to ensure that everything is right and to make any adjustments, if necessary. This practice goes back a long time, when early photographers would pull out a loupe to view the images at high magnification on their ground glass view plates, so as to achieve critical focus. I wonder if their colleagues scoffed at them, too. "Peeping" and "chimping" are done at various times and for various reasons. I'll discuss all of these. My first exercise in "peeping" is done when I am testing new equipment (usually a new lens) to determine whether it is functioning properly. It is rare that a lens doesn't function properly, but I've had excessive chromatic aberration with two copies of the Sigma 12-24, which is admittedly a difficult and demanding lens to manufacture well. (My 3rd lens was the charm.) I never get very fancy with my testing. I unfurl a newspaper, mount my camera/lens on a tripod, and photograph the text. Then I examine the images blown up at high magnification to compare to test results found on the Internet, for instance at www.slrgear.com. I pay particular attention to image sharpness and chromatic aberration. Many photographers prefer to test lenses by shooting real-world scenes and making large prints. However, much more can be learned, particularly concerning chromatic aberration, by photographing a finely detailed black-and-white target at well controlled distances from the camera. I do both of these sorts of tests. I've shown a spatial grating at the Nyquist rate, lower left, a pixelated translation of the spatial grating to the right, and then to the right of that a pixelated edge of approximately the same band limit. This shows the theoretical maximum a sensor/lens combo could achieve if (a) the resolving power of the lens exceeded the resolving power of the sensor and (b) the sensor's resolving power were low-pass limited to half the Nyquist rate with a perfect (infinitely sharp) lowpass filter. This of course is not possible. 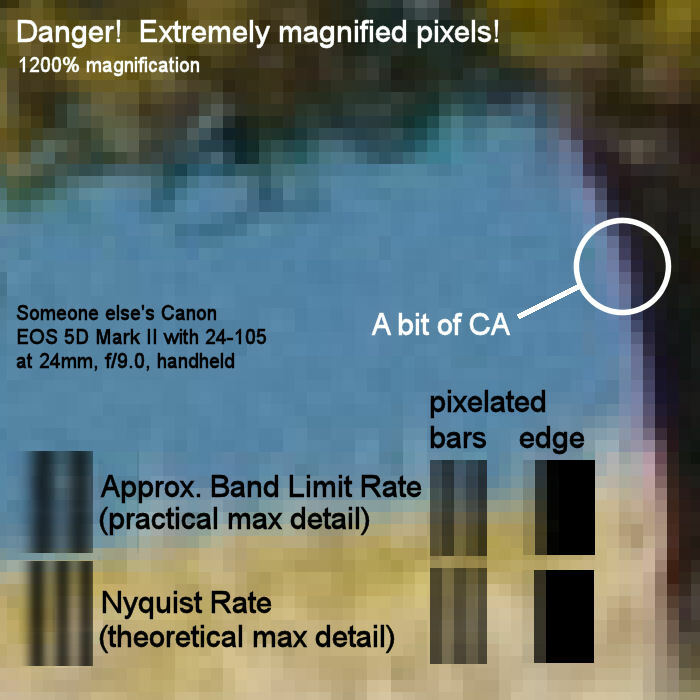 Above that, I've shown a spatial grating, pixelated bar pattern, and pixelated edge at approx 1/3 the Nyquist rate, representing what I'm pretty sure are the high pass properties of the antialiasing filters that Canon uses. (I've never seen actual numbers, and Canon isn't talking.) A more conservative rolloff frequency is used so as to sufficiently suppress spatial frequencies at the Nyquist frequency (since no antialiasing filter is perfectly sharp). Note that Canon's filters push this limit pretty hard and do fail to catch some aliasing under unusual circumstances. Nikon is more conservative -- but fuzzier. I do see a bit of CA in the lens, but that's not unusual for high contrasts (e.g. trunk edge) at the extremes of the zoom range. My other reason for testing my new lenses is to assess their operating parameters. Although few lenses can be called "defective," there are still often minor differences between copies. I examine sample images throughout the aperture range to assess center and corner sharpness and to determine the optimal and usable ranges for the particular lens copies I own. Although there are some great sources of test data on the Internet, including my favorite, www.slrgear.com, the differences between their test lenses and my own lenses can be substantial. For instance, my own Canon EF 24-105 f/4L lens performs far better than much of the test data would indicate, particularly at wider apertures. Although some "pixel peeping" is required in the testing of new equipment, that's only the tip of the iceberg. Most "peeping" and "chimping" is done in the process of day-to-day photography. Most of my photographs are in short series of perhaps 5 to 50 shots. My first shot is usually taken in Av mode: I'll select my aperture, based on my knowledge of the functional parameters of the lens and the desired depth of field. (I often use Harold Merklinger's object field method for estimating depth of field.) Then I take my first shot, usually at ISO 100. I don't care if the shot is well composed. I just assume it's not a keeper. I immediately display the image and histogram on the LCD (or "chimp"). The histogram shows me how my exposure is situated, with respect to an approximately ETTR (expose-to-the-right) target. The histogram is graduated in stops, and I can very quickly determine either a target shutter speed or the needed exposure compensation to achieve the exposure I want. I can also assess whether that shutter speed would be too slow (or fast) and can make adjustments to ISO if desired. Finally, I can zoom in on the image ("peeping pixels"), and pan around between foreground and background objects to assess my depth of field -- to make sure what I want sharp is really sharp and what I want fuzzy is truly fuzzy. I might adjust aperture against speed and ISO on this basis. Depending on whether my light is stable or whether it is rapidly changing (e.g. drifting cloud cover), I'll either switch to manual (with desired shutter speed and aperture dialed in) or remain in Av (with desired exposure compensation dialed in). Then I'll shoot my second shot, with the expectation that it might be a keeper -- or might not. I "chimp" again, this time paying particular attention to the highlights. I have my display set up to flash blown-out areas. Sometimes I will intentionally blow out the brightest highlights to leave more room for shadow detail. An examination of the display shows me precisely what I am blowing out, if anything. I'll make one more adjustment to my exposure, and then I'll get ready to shoot for real. I still usually "chimp" my third shot, just to confirm that everything is as I want it. However, this is pretty quick thing to do. At this point and beyond, I will take a series of shots without "chimping" to try to capture the image I want. Once I feel I have obtained 2-3 shots that work, I review them, "chimping" yet again. I briefly glance at their histograms to check that the exposure was right, I pan around through the image to make sure everything was in place, and I "peep" at maximum magnification to ensure that there were no focus or camera movement problems. If I can't confirm at least two "keepers," I shoot a few more times, usually with modified settings. When I finally download my images into the computer, I go through each image series at full screen mode, rating each image and deleting those that are completely unusable. I often have 3-4 shots that are approximately equivalent in exposure and composition. The deciding factor as to which one I postprocess then depends mostly on sharpness, and to assess sharpness, I "peep the pixels" on each candidate image. It is at this stage that I am also able to monitor my technique to ensure that I am getting as much from my equipment as I know it can deliver, based on prior testing. If any aspect of my technique is lacking, it is here that I will most easily recognize it, whether it relates to camera stability, selection of shutter speed, assumptions about depth of field, or noise relating to ISO. I of course do postprocessing on my images. I prefer to minimize reliance of sharpening in-camera, leaving that task to postprocessing. So after I make my various level corrections, crop, etc., I apply unsharp mask (USM). Many photographers will only apply USM immediately prior to use of the photo, so that their USM parameter will best suit the end use. However, I apply a mild USM just prior to storage of the finished photograph, irrespective of the final form in which the photo will be used. To do this, I "peep pixels." I zoom in on representative edges throughout the frame, and adjust my USM parameters so as not to create a maximally sharp transition across pixels without creation of contrast "overshoot." I may of course apply further USM later, depending on how the photograph is used. These steps represent the minimum of processing I might do on a photograph. However, I often do more invasive editing prior to the USM step that is fine-enough grained to take me to the level of the pixel. These steps invariably involve making selections, and I find it easier to make these selections when viewing actual pixels. Then when examining anything that is blended across layers, there is no substitute for examining various features and edges at the pixel level. Not all photographers do their editing at this level, but I feel their results usually show it. One of my goals in editing is to ensure that all edge transitions appear natural, and this can only be done at the pixel level. Many will say this is all too much "peeping" and "chimping" and that no photographer should engage in such acts. However, these practices are a normal and necessary part of my workflow. They are not the "navel gazing" practices of testing equipment for the odd pleasure (?) or compulsion of testing -- testing for testing's sake. Rather, they are an integral part of the production of each and every one of my photographs, whether for sale as artwork or for images delivered to a client. I don't engage in these practices because I am under some delusion that a photograph should be infinitely zoomable or that there are not image defects in even the very finest lenses. Rather, I engage in these practices to monitor with clarity what is in my images at each stage of a methodical workflow. Finally, I hope those who are reading this do not interpret this discussion as a condemnation of those who do not "peep" or "chimp." We each have a workflow upon which we have come to rely -- a workflow that suits our particular needs and delivers the results we demand. It is indeed possible to do brilliant photography with never a "peep" or "chimp." My only purpose in writing this piece is to explain how a legitimate workflow might include these practices and to appeal to the "cool" crowd to go easy with the finger-wagging against those who do not do photography their way. We would all be better served by having a bit more respect for the diversity in photographic methods. Irrespective of which side of the peeping/chimping debate you fall on, you may enjoy having the T-shirt.